There are many places for board member training depending on what state you live in. I’m a member and big fan of Community Associations Institute and their training programs. I’ve used their training programs to educate property managers and customer service employees at my previous full service management company. The following are a few good options for board member training resources from Community Associations Institute (CAI). Membership to Community Associations Institute provides a valuable resource with how to articles from industry experts. You will get a copy of your local chapter’s magazine “Common Interest” as well as the national magazine “Common Ground”. Plus you’ll have access to previous issues and search for articles to help with issues you are facing at your community. Additionally, Find solutions to your community association issues and keep up-to-date on community association trends with CAI’s books, pamphlets, award-winning magazines and newsletters, CDs and more on their online bookstore. You don’t have to reinvent the wheel. Many CAI business partners, management companies, homeowner associations and chapters have developed education videos on a wide range of community association industry topics, some of which you’ll find listed here. This learning event is put on by local CAI Community Association Institute (CAI) chapters. This 5-6 hour seminar covers: Legal, Insurance, Financial, Maintenance & Capital Project Planning as well as a lengthy Expert Q&A. I have been a speaker numerous times for this training and I like its interactive nature. Where else can a board go and ask bunch of questions for basically free from industry experts? The course description reads: Do you serve on the board of your association? Are you considering serving? Whether you are a seasoned board member, a recently elected board member or unit owner wanting to understand more about how an association runs, this is course it for you! Your community is your home and it is probably your biggest investment. But did you also know it is a business? The role of a community board is to protect and increase property value in an association. In addition, their role is to preserve the quality of life in accordance with state & federal laws and association documents. This is accomplished by operating the association, maintaining the common property and enforcing the governing documents. Becoming a good board member is a process; but, you can minimize the errors and the time it takes you to get up to speed by attending this seminar. We have gathered together a group of industry professionals: legal, insurance, maintenance, financial and capital planning to share their expertise. In addition, this course provides the opportunity to interact with fellow board members and share your challenges and your triumphs! Click on this link to find a CAI Chapter near you and see if they are hosting this event. Education for homeowner leaders just got better. The Board Leadership Development Workshop teaches you how to communicate with association residents, hire qualified managers and service providers, develop enforceable rules, interpret governing documents and more. Module 1: Governing Documents and Roles & Responsibilities. To start you on the right path, Module 1 helps you understand the legal authority for your association. It also clarifies the duties and responsibilities of each board member and the professionals who are available to assist the board. Module 2: Communications, Meetings and Volunteerism. Module 2 helps you learn how to maximize volunteer involvement in your community association by improving board communications, conducting effective meetings and building community spirit. Module 3: Fundamentals of Financial Management. Module 3 introduces the fundamentals of association financial management, including guidelines for protecting your association’s assets, preparing a budget, planning for the future and collecting assessments. Module 4: Professional Advisors and Service Providers. Because putting together the right team to support your association can be challenging, Module 4 provides practical tips on finding, evaluating and hiring qualified professional advisors and service providers. Some states have specific laws for community associations and a few of them require mandatory board member training. For many of these states the programs offered by CAI meet this requirement. Whether your state requires training or not it is a good idea to have a solid understanding of your role in operating the community and the related laws. 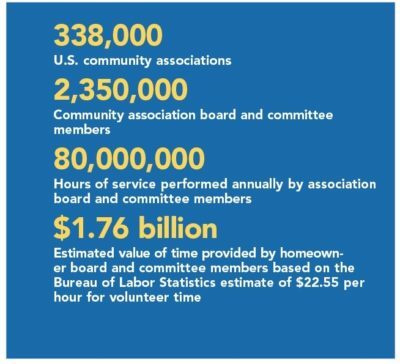 I encourage you to look into these and other board member training resources from Community Associations Institute (CAI). I find time spent on education reduces the time to do my job and I am sure that you will get the same benefit from this investment that is paid for by the association.